Social media has become an essential and important marketing tool for businesses, however, when using social media as a brand, there are many traps and obstacles you have to avoid in order for a successful marketing campaign. If you would commit them, they might have a negative effect on your brand both short and long-term. Of course, the first step in avoiding mistakes on social media is being aware of them. Therefore, I have created a list of the Top 5 Things You Should Never Do as a Business on Social Media. Hopefully, this article will help you stop doing any mistakes you might be committing at the moment or mistakes you might risk committing in the future. I’ve seen many brands do this, and unfortunately, it can backlash immensely. Know that there is a difference in being controversial and offensive. Being controversial can sometimes be good as it creates a debate and helps you get a broader reach. However, being offensive is the wrong tactic to get reach. Being offensive can be anything from sharing racist jokes to making fun of disabled people. A way to make sure that your posts aren’t offensive is to have several people approve them before being shared. While this might demand extra effort, offending someone or sharing inappropriate posts can seriously harm your brand, and that is not worth the risk. 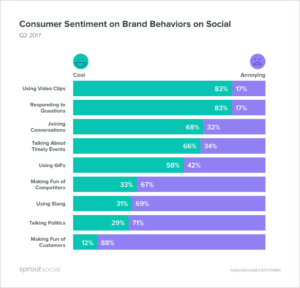 Here is a study by SproutSocial where they asked consumers how they react to brands when they share various content on social media. As you can see, making fun of competitors, which means being offensive towards them ends up as the least attractive thing they can do on social media, where 88% of consumers find it annoying. So how do consumers react when you share content they find annoying? Well, in the worst case, you can become the reason to a social media storm against you brand, which will have an extremely negative effect. An example is the social media storm #Boycottunited that was targeted towards United Airlines when they dragged a passenger of their plane. Now, this social media storm wasn’t caused by something they did on social media, but the principle is the same. 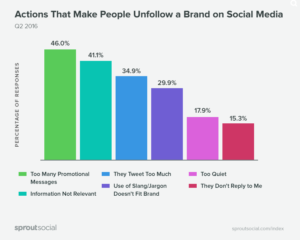 The most common result is people unfollowing your brand, and not far behind is boycotting your brand. And if the offensive content you share causes a social media storm, it can have a huge negative impact on your brand that you don’t want to witness. So whatever you do, be careful with what you post and avoid sharing offensive content. Doing this can seriously harm your brand. Therefore, this point is one of the most important of the Top 5 Things You Should Never Do as a Business on Social Media. If an angry customer comes to social media to complain about a bad experience, the worst thing you can do is delete their comment. 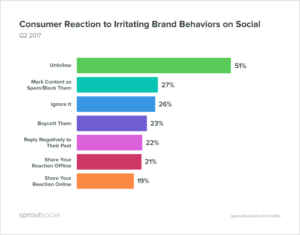 This only increase their anger, and worst of all leads to them telling their peers about their experience with their brand. 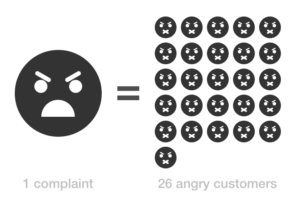 In fact, 1 angry customer who complaints often mean that you have 26 more angry customers who aren’t saying anything. Instead, you should take the complaint as a valuable insight in what problems your customers might have with your brand – and see it as an opportunity to make things right. Studies show that happy customers on average tell nine friends about their experience with your brand. On the contrary, unhappy customers on average tell sixteen. That’s why responding to the angry customers who addresses an issue on your social media is key, as it can help you convert them to happy customers again. The only thing that is needed might be an apology or a compensation. As a matter of fact, 37% of unhappy customers satisfy with a compensation. On the other hand, if you add an apology to that compensation, 74% of consumers report that they are satisfied. Therefore, when you get a complaint on social media, do everything in your power to make things right, and do not for god’s sake forget to apologize, because a simple apology can do a lot for customer satisfaction, as seen above. The results are quite clear. 46% of consumers unfollow a brand that posts too many promotional messages, and 34,9% unfollowed a brand that Tweeted too much. Both of these are ultimately based on a brand spamming too much on social media. And if you add them together, you can see that a whopping 80,9% of consumers unfollow a brand unfollow a brand on social media as a result of spam posting. When sharing content on social media, avoid posting too many promotional messages. In between promotional messages, share valuable and interesting content that your audience likes. Of course, what exactly that means differs from niche and business, but in some cases, it can be a funny meme and in other cases a “Did you know..” post.Only you know best what your audience responds well to. Only you know best what your audience responds well to. You should also make sure that you aren’t posting too much and clogging up your feeds, as this is another reason why consumers unfollow brands on social media. 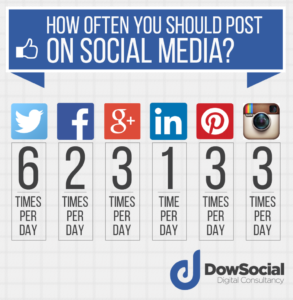 How often you should post depends on the platform, so it’s important that you read the recommended maximum amount of posts that you should share per day and adapt to that number. Read: What is the Ultimate Amount of Posts You Should Publish on Instagram? This number can, of course, vary slightly depending on different factors, but you should use the numbers as starting-points. The golden rule us to always provide value with what you post. Before you make a social media post, ask your self “what value do my followers get from this post”. If the answer is zero, then don’t post it. If it is knowledge, entertainment or information – post it. It is common that brands bite of more than they can chew on social media, starting accounts on every single social media platform out there, with the ambition of sharing every single day. However, as they realize how time-consuming it can be, the social media sharing slowly decreases, and then completely stops for a long period of time. This has several negative effects on your brand. First of all, being consistent on social media is the foundation of reaching true success. So obviously, being inconsistent, and sometimes even go to having a non-existing presence on social media does the opposite. 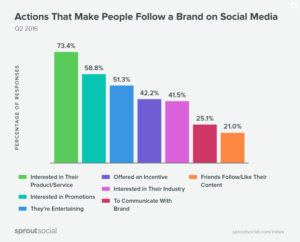 The conclusion is that people are following your brand because they are genuinely interested in what you have to say and share on social media, so if you all of a sudden, what reason is there to follow you? Secondly, if your brand stops posting for a longer period of time, people might belive that you have quit completely with social media and will never post again – and unfollow you. The outcome seems to always be unfollowing. However, there’s one further result of a brand that stops posting, and that is a loss of clients. Many consumers go to social media to see what the brands are up to, but if they suddenly realize that you haven’t posted for a month, or even a year, it can result in the belief that your brand has gone bankrupt or simply stopped with your business. Undoubtedly, this will lead to people starting to question whether or not they should shop from you, in the belief that they might never receive their product. The conclusion is: be consistent. And if you don’t have time to be consistent on all social media platforms, choose a few, or even one and stick to it. Being consistent on one platform and building your brand is better than spreading your efforts across multiple ones. There’s not a lot of things that is as unattractive for consumers as when brands go into self-defense. This is most common when receiving complaints, but it is not completely uncommon to see brands go into self-defense when receiving constructive criticism. This is, of course, a big no-no. It doesn’t matter if the comments you are receiving are plain and simple hate, or actually holds any value. You should always respond your customers with kind responses, apologizing for any inconvenience your company has caused them. Consumers don’t want to hear a bunch of excuses (unless they’re relevant and help them understand the situation), they just want their issue fixed. And even if they’re just angry and have no real reason to attack you, you shouldn’t go into self-defense, as this only portrays your brand in a bad light to your other followers. Do your best to solve the issue they have, and in the worst case (literally worst case), simply stop responding. This how should only be done if you’re facing trolls. As responding only feeds them. But. Be very careful as you don’t want to stop responding to real customers who you have a chance of converting to happy customers again.